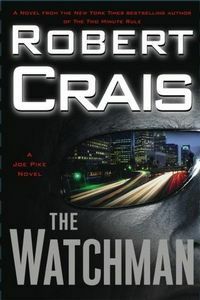 The Watchman by Robert Crais, a Mysterious Review. Review: Robert Crais, author of the Elvis Cole mysteries, takes Cole's partner Joe Pike and presents him center stage in The Watchman, a perfect vehicle for this cryptic and inscrutable character. Cole himself plays an important, though clearly subordinate, role in the book. Larkin Conner lives the life of a billionaire's daughter. Think Paris Hilton, but sober and with a conscience. One night while returning home, she accidentally hits a car, injuring its passengers. Before she can call for help, the driver speeds off and a man in the back seat disappears down a nearby alley. Fast forward several days and The Watchman opens with Larkin under the protection of Joe Pike and running for her life. Pike's assignment is to keep Larking alive at all costs, and trusting no one, he takes refuge in a safe house, the location of which is known only to Pike, Larkin, and Elvis Cole. As Pike and Cole try to figure out why Larkin is a target, they realize that essentially everyone claiming to want to protect her is hiding behind a facade, withholding information that will save her. Crais vividly portrays the primary characters in The Watchman, imparting into each unique and readily identifiable features. Yet Joe Pike remains largely an enigma. Methodical, thoughtful, intelligent, analytical, determined, meticulous, all surely describe Joe Pike. Yet he defies a visual identity in the reader's mind. Ask ten people to describe Pike after reading The Watchman, and there will be ten distinct answers. That Crais can create such a well-defined character and keep him virtually anonymous is truly remarkable. Though the plot could have been overly complicated, Crais wisely chooses to keep it relatively simple. Pike is clearly mystified by the actions of everyone involved, but he keeps coming back to the basic question before him: Why is Larkin a target? The answer to this simple question not only makes his task of keeping her alive that much more achievable, but provides clarity to other inconsistencies in this case as the pieces of the puzzle fall into place. The Watchman is an outstanding example of a mystery thriller, and will certainly be remembered as one of the year's best novels. Acknowledgment: FSB Associates provided a copy of The Watchman for this review.